This is gonna be a short post because I have a lot of phone calls to make. 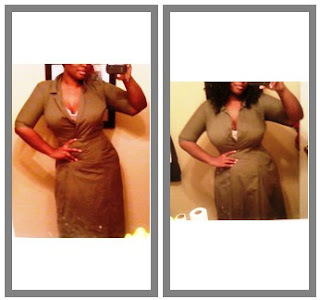 Before surgery, I thought that I'd lose massive amounts of weight every single week. I see that's not true, but its really fine with me. Even though the scale is crawling along at the speed of a half dead escargot, I'm making progress! I would have been aghast at the thought of losing 8lbs in 2 months and ready to throw in the towel, but by documenting my journey with pictures and keeping track of my weight, its really given me a good perspective. Having Sleevie Wonder in one corner and a great support team in the other, I didn't give up this time. Proud to be able to call you my friend! Keep it up lady! Your still doing the dogone thang! Man. I had that epiphany the other day. I looked at the "before and after" pictures on OH and was like "wow". I wanted that to be me...quickly. It just doesn't work that way. This is a gradual process. I'm glad someone else gets that. I'm done beating myself up, too. I feel you on this one. For real.